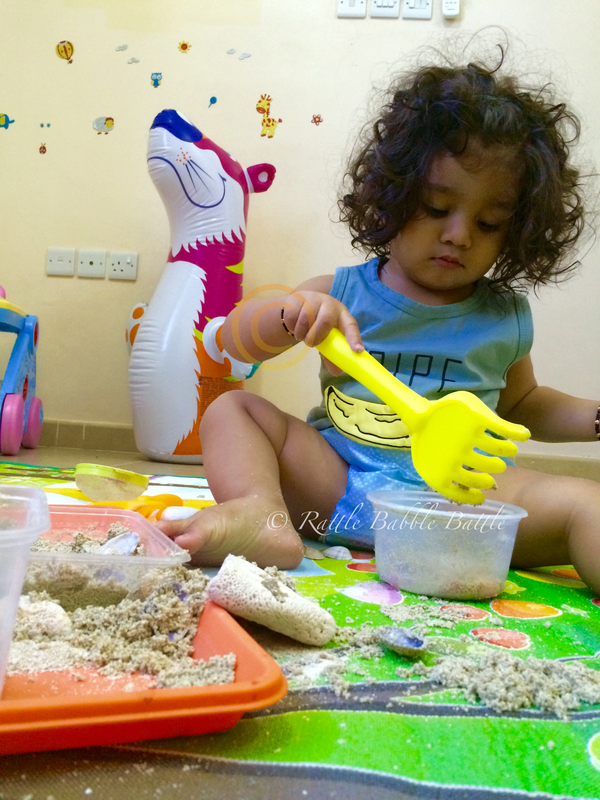 Sensorial activities are one of the favourite activities of toddlers as they love to mess around.One of the lead I got from N’S liking is that he loves water a lot.A play date to the sea makes him so happy, he loves to play in the sand with his shovel for hours.He loves to splash with the water and runs while the waves chase him. 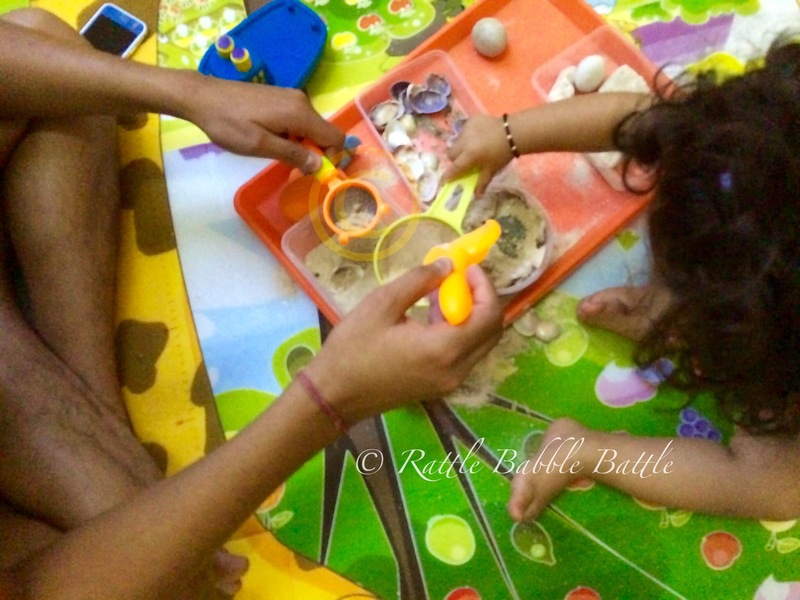 I have been planning to do a ocean themed activity for so long but somehow couldn’t manage something or the other.I wanted things to be collected naturally from our visits to the beach. 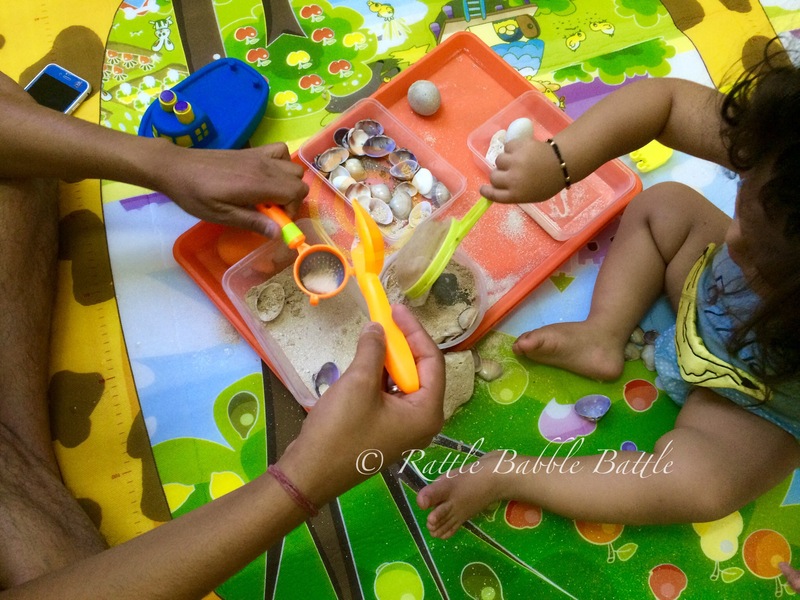 1.Let your child touch and feel all the content on the tray while you name it to them.This way they learn new things and how to name them while they see it next time.When they feel the sand, shells and pebbles they can relate it with feeling like rough, smooth etc. 2.Take a box/a big tray/tub and mix all the dry items in it and let your little one discover things on his own.ask him/her to find shells and count the ones he could find. 3.Ask your little one to separate all the items from the box give a wide mesh strainer to separate the sand from pebbles. 4.Let them do some pouring activity by pouring the water to different container or just let them enjoy by pouring water and mixing everything and making this activity a messy one. This is how we did it and had loads of fun.This was our weekend activity and papa joined it to make it messier and merrier. I LOVE this activity! I cannot wait to do it with my little ones! i loved the video dear!!! this is an awesome idea i will be doing it soon with my little one too!!! What a fun activity! A great idea for all the shells and pebbles we collect on beach vacations. Wow this looks like so much fun. Will give it a try this weekend. i am sure my kids ll love it too..
Great activity to be tried during this beating summer. Ha … Ha … Ha …..
Ole! how cute I would love to meet this lil man,muah! those chubby cheeks! thanks abba and we would love to meet too. How wonderful is this concept! I tried something like this with Kinetic sand. Hey there this battle is my journey of motherhood. I am a banker by profession but currently a stay at home full time momma to my boy and not so good home maker to my hubby.